The Micro Aggression Panel was designed for anyone who wants to get their firearm off the hip yet keep it in a familiar and natural draw position. 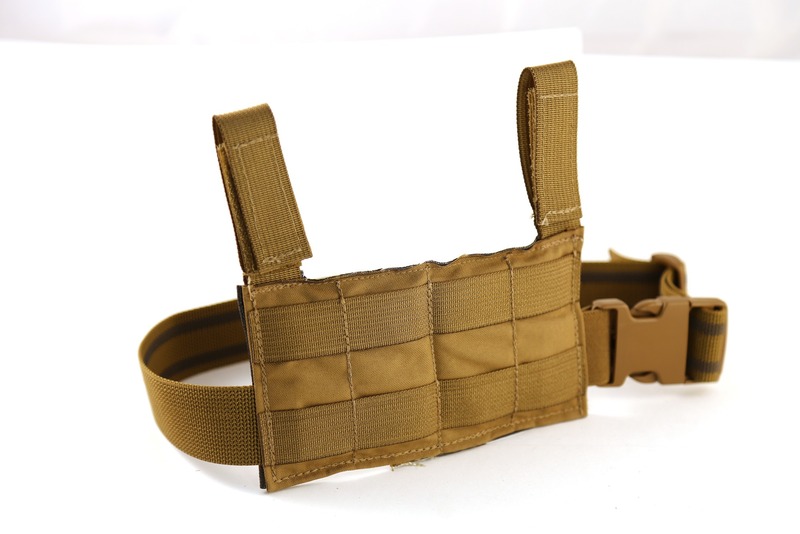 This 100% US made nylon panel is designed to move your holster off your belt away from objects at your midline, like body armor, pouches or a backpack hip-belt. Or in inclement weather, allow your firearm to be accessible even with a snug jacket hem. The lowered position makes for a quick draw and by running the pistol on a panel it helps distribute the weight off your hip. 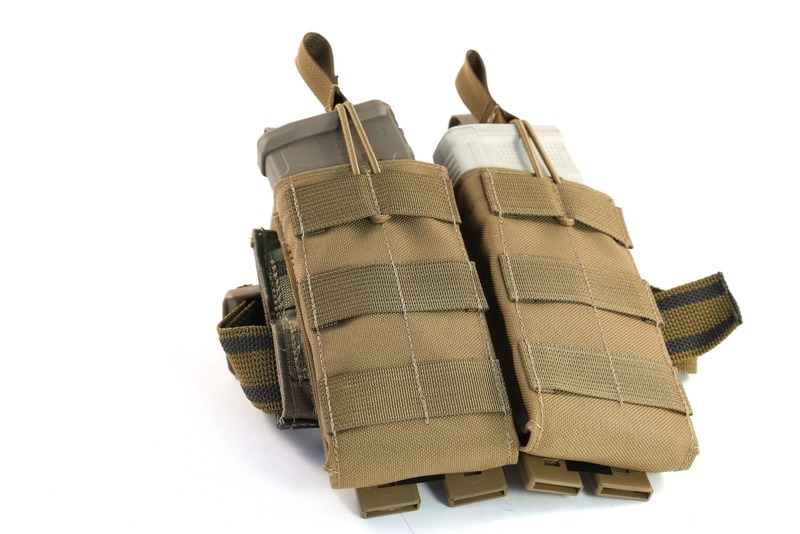 Unlike many traditional drop rigs, the Micro Aggression panel sits much higher on the thigh to prevent traditional issues with drop rigs, such as floppy holster syndrome. It's also much smaller, because it's really silly to have a massive panel attached to your leg simply to attach a relatively small single pistol holster. 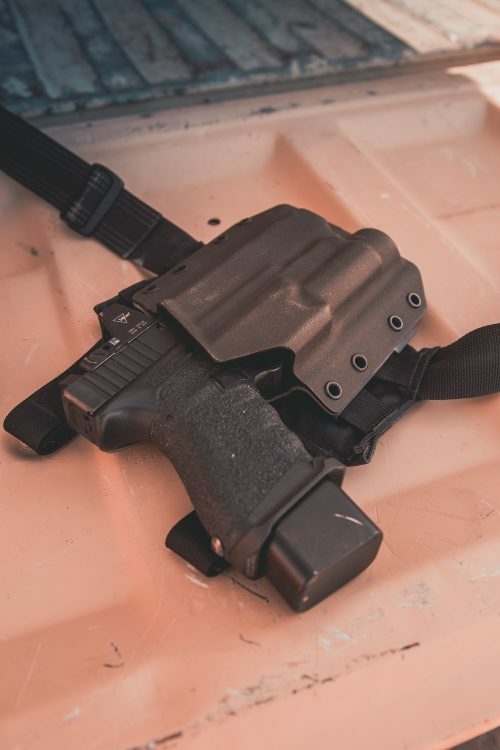 Additionally, to prevent floppy holster syndrome, the panel is stiffened with a dense foam and backed with a no slip hypalon panel. 2 rows of custom spec webbing allows virtually any MOLLE or PALs compatible items to be attached, in addition to any of our holsters with Malice clips attached. 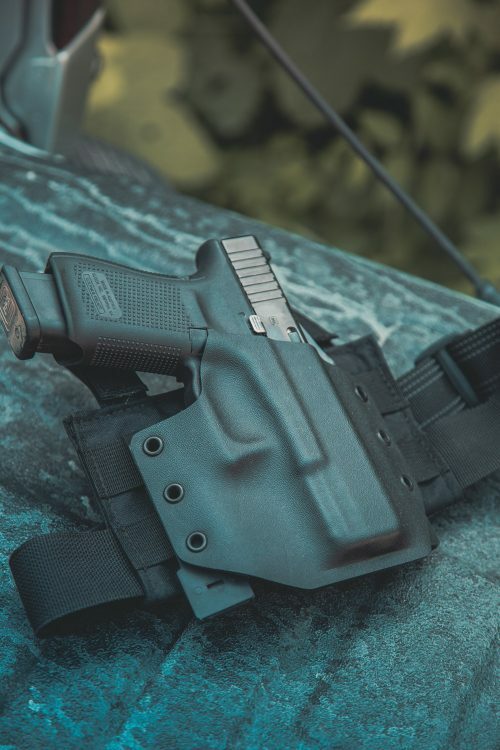 Wider spacing between bartacks allows easier attachment of our Kydex holsters. Total panel size is 4” tall by 6 ¾” wide. 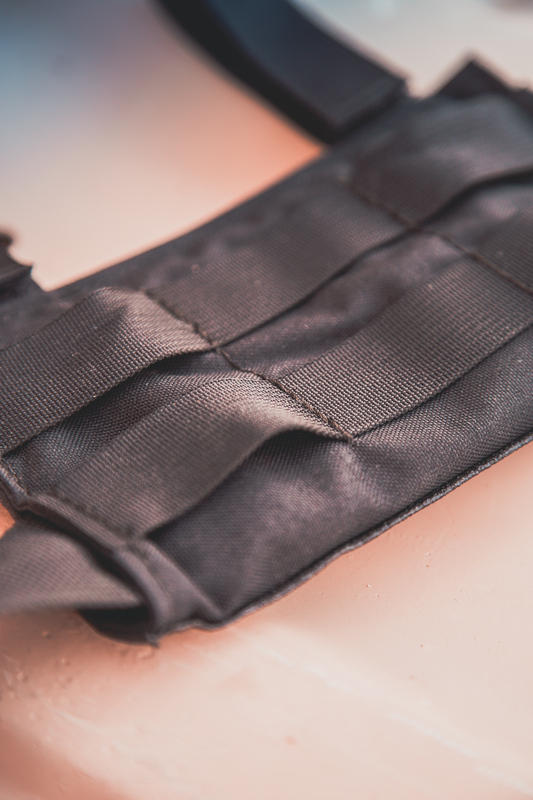 The stiffened 1" dual belt loops are attached with a Velcro closure, allowing the Micro Aggression panel to be attached to just about anything, including MOLLE/PALs battlebelts, standard belts, backpack hip belts or whatever else you'd like to get off your hip. 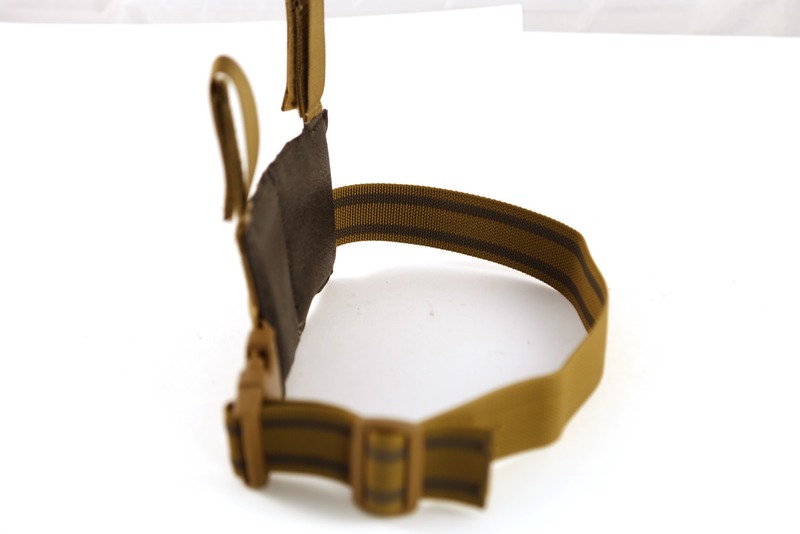 Speaking of straps, the thigh strap is 1.5" gripper webbing with an elastic stretch panel. Once you have your strap dialed, you can rotate it into the tunnel on the rig keeping it out of the way. Since the strap is "floating" and stretches, it greatly eliminates issues rubbing and chafing issues traditionally associated with. This panel was designed to fit any of our holsters with attached Malice Clips. 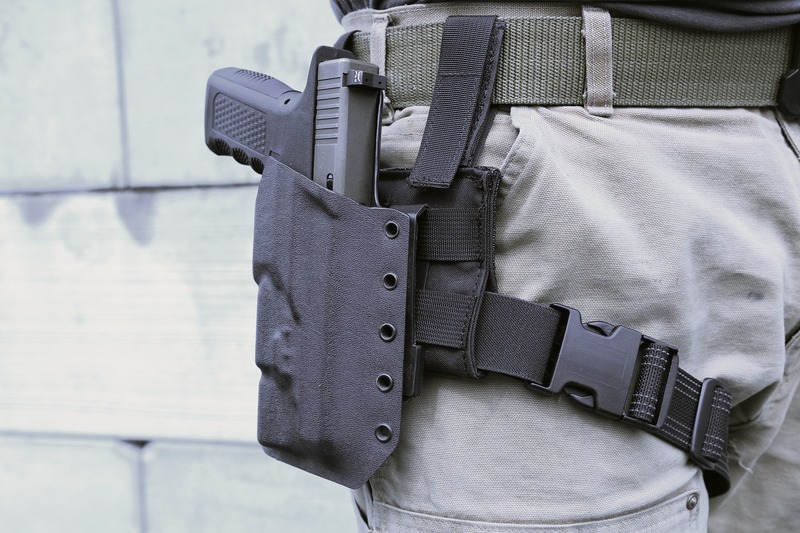 If you’ve wanted to run the holster off your hip but don’t want to carry on your chest, this is a great option. Low profile loops sit flat on a variety of mounting surfaces. THIS IS THE THIGH PANEL ONLY! 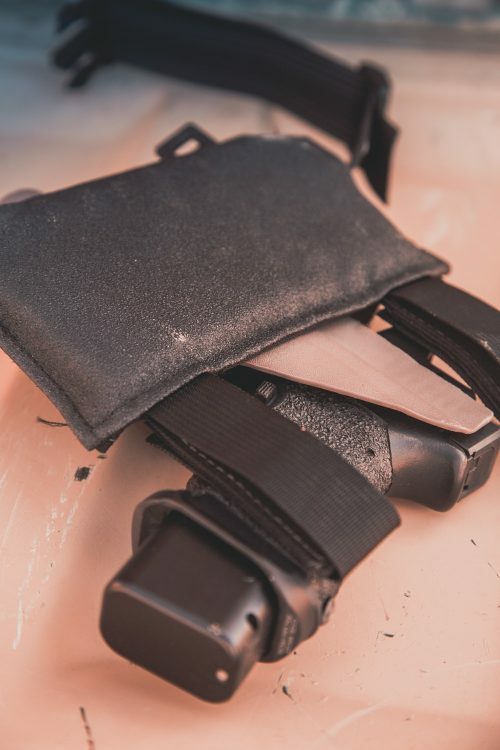 To order a holster that attaches to the thigh panel, please select a Ronin OWB with Malice Clips. This is a very simple, yet, almost perfect solution to packing a handgun on your hip, while wearing a pack with waist belt! I have been trying to modify or attach holsters to backpack waist belts for years, which seem to always ride too high or too far back or interfere with straps. Then, if you take your pack off, you don’t have your gun on any more. 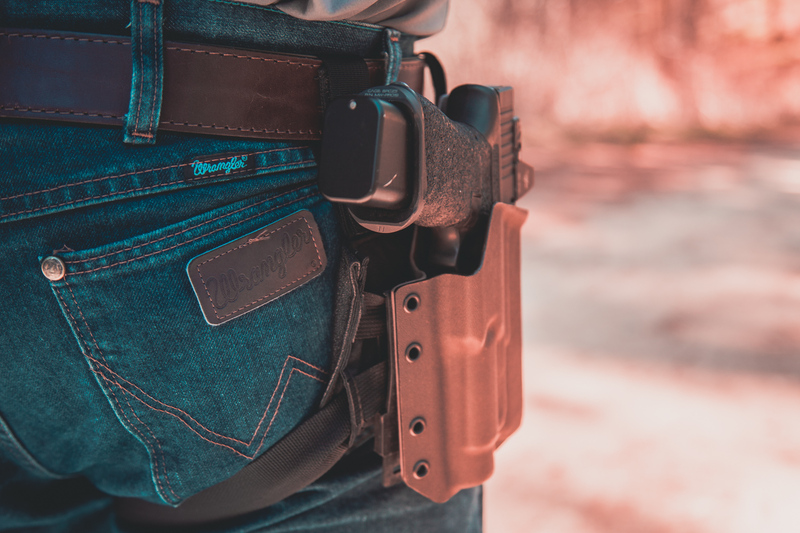 The Micro Aggression panel allows a Ronin to ride just below the waist belt, yet doesn’t ride as low as the typical drop holsters/thigh rigs that seem to hit everything or get in the way. I have one for my Glock 20 and it works really well. 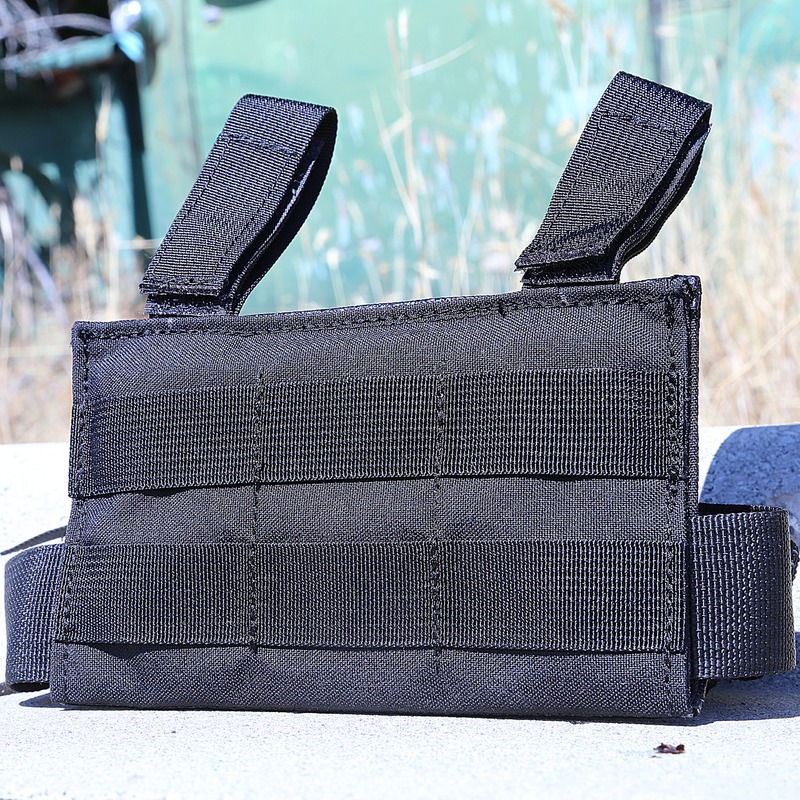 This 100% US made nylon panel is designed to move your holster off your belt away from objects at your midline, like body armor, pouches or a backpack hip-belt. Or in inclement weather, allow your firearm to be accessible even with a snug jacket hem. Currently terms such as Micro Aggression, Triggering and Mansplaining are all the rage, and as red blooded capitalists we felt the need to respond to current market trends. While we couldn’t figure out what the hell Mansplaining is and feel that we have triggers well covered in our holsters already, we thought we could make a product that would be useful for fighting off both micro and macro aggression. Should you be micro-aggressed those items will be in the perfect spot for quickly grabbing them, with the hand falling naturally falling on the backstrap of the firearm, ready to draw. 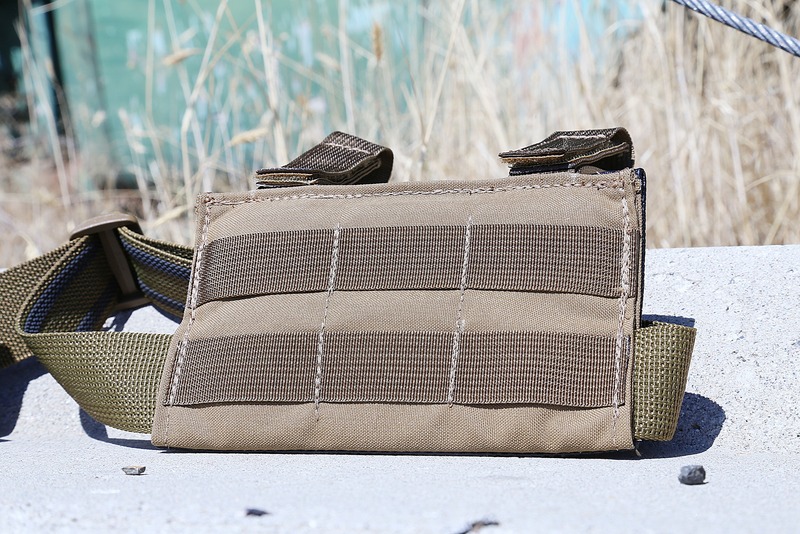 A rifle or pistol mag pouch can be run on the left side if a situation should become a macro level of aggression, letting you reload quickly and efficiently. 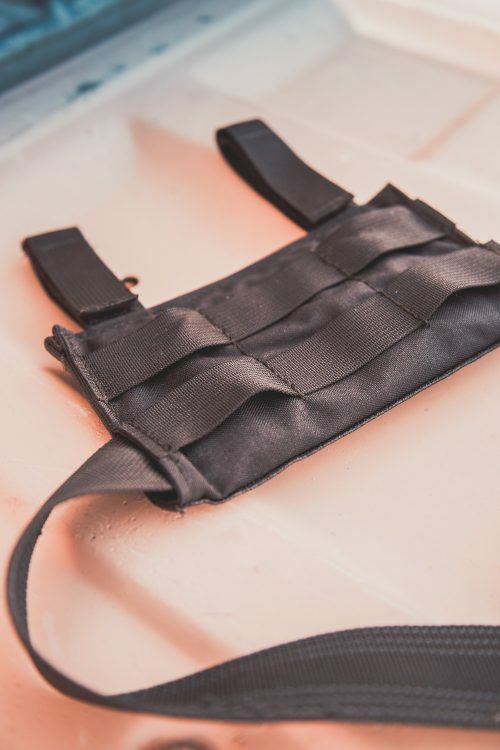 The stiffened 1″ dual belt loops are attached with a Velcro closure, allowing the Micro Aggression panel to be attached to just about anything, including MOLLE/PALs battlebelts, standard belts, backpack hip belts or whatever else you’d like to get off your hip. 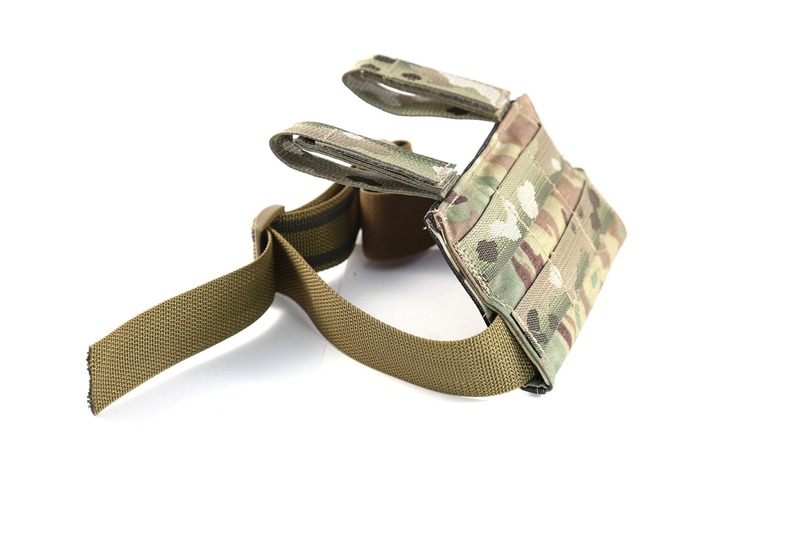 Speaking of straps, the thigh strap is 1.5″ gripper webbing with an elastic stretch panel. Once you have your strap dialed, you can rotate it into the tunnel on the rig keeping it out of the way. 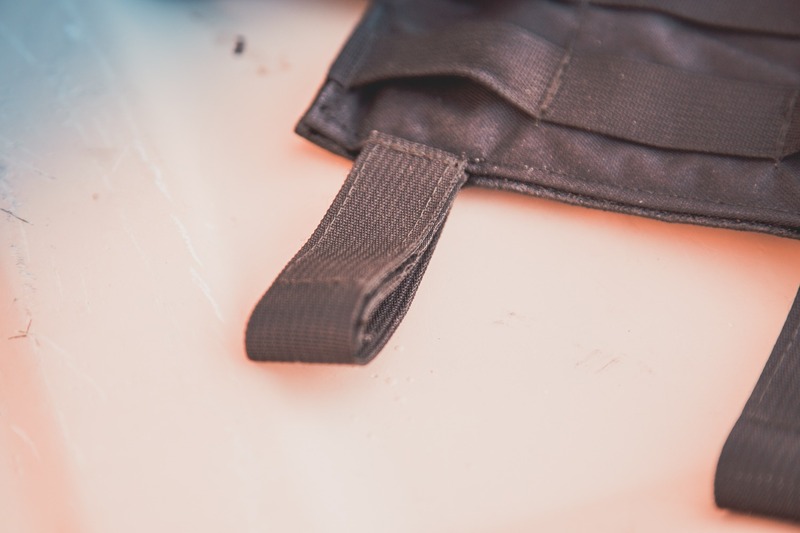 Since the strap is “floating” and stretches, it greatly eliminates issues rubbing and chafing issues. 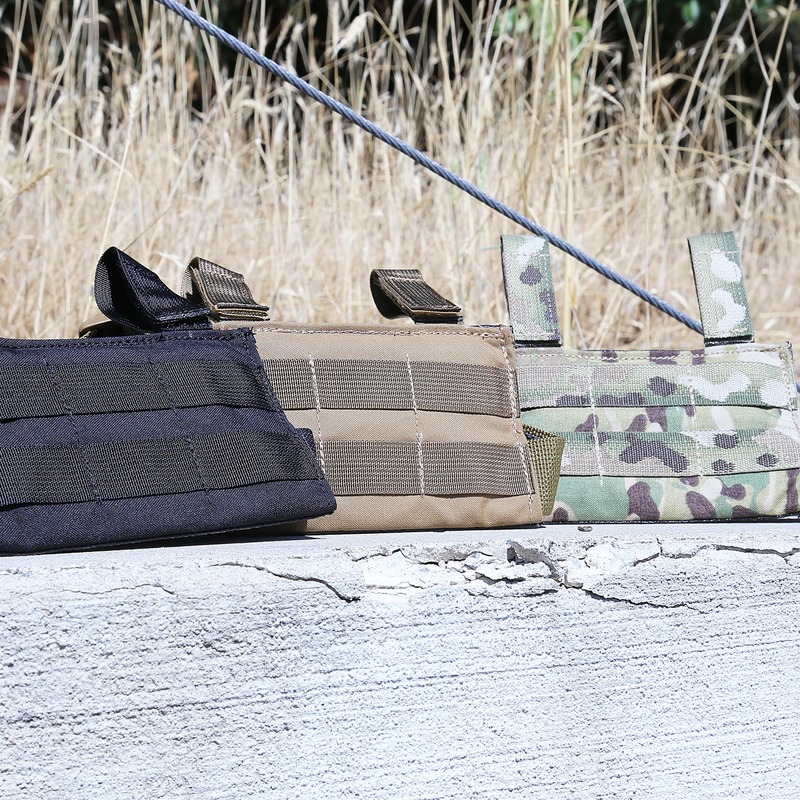 Unlike many traditional drop rigs, the Micro Aggression panel sits much higher on the thigh to prevent traditional issues with drop rigs, such as floppy holster syndrome. 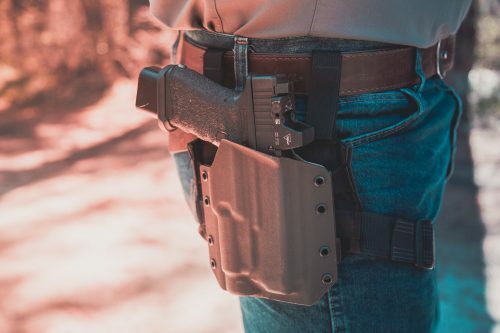 It’s also much smaller, because it’s really silly to have a massive panel attached to your leg simply to attach a relatively small single pistol holster. Additionally, to prevent floppy holster syndrome, the panel is stiffened with a dense foam and backed with a no slip hypalon panel. Speaking of pistols – if you wish to carry a large and heavy pistol such as a Smith and Wesson 629 or HK Mark 23 and don’t want to carry it on your chest – this is an excellent option. The lowered position makes for a quick draw and by running the pistol on a panel it helps distribute the weight off your hip.